A perfect example of ‘What a tangled web we weave when first we practice to deceive’! Sculptor Brindsley Miller attempts to juggle his fianc?e, her father, two neighbours, his ex girl-friend (who turns up unexpectedly) and a millionaire collector who is (Brindsley hopes) going to buy some of his work. Oh! – and all this during a power cut which plunges his flat into darkness. Peter Shaffer makes brilliant use of this device to produce an evening of hilarity. "A tangled web of mishaps"
A tangled web is woven in Peter Shaffer's Black Comedy written in the 1960s. Sculptor Brindsley Miller attempts to juggle his fiancee, her father, two neighbours, his ex-girlfriend (who turns up unexpectedly) and a millionaire collector who Brindley hopes will buy his work. All this happens during a power cut! The plot thickens when Brindsley, well put over by Trevor McKie, "borrows" antique furniture (for ease of lifting, just boxes) from his next door neighbour, Harold , a camp Brian Howlett, in order to impress Mr Bamberger, a rich German (Steve Williamson) who has agreed to view his art. Mayhem ensues when Harold returns unexpectedly. Instead of getting the lights fixed by an electrician who just happens to arrive and who they mistake for the art collector, Brindsley is anxious for them to remain unfixed so that he can attempt to smuggle back Harold's furniture. This play is different from others because when the mains fuse blows and the cast grapple in the dark, the audience can see them perfectly. Before that, when they are supposedly in the light, all is darkness. It is a credit to the cast that in bright light they can walk around hesitantly as though in darkness. This leads to interesting encounters due to mistaken identity. Just after the power cut, suppressed spinster neighbour, Miss Furnival arrives, devours a large gin and, although a non-drinker, thoroughly enjoys it. Janet Slade is delightful in the part as, inebriated, she lets it all out. Two other women also make us laugh. They are Laura Whitehurst as Brindsley's dumb fiancee, Carol and Bev Stuart-Cole as the ex-girlfriend who turns up unexpectedly adding to the dismay of the, by now, frenetically energetic Brindsley. I like the performance of John Westbrooke as the Colonel who spoils his daughter, Carol, a man who Brindsley is anxious to impress so he will agree to their marriage. This play is almost impossible to describe but I assure you you'll love every minute of Steve Williamson's production. It fits in so many angles with perfect comic timing in a short space of time ensuring you'll get excellent value for money in just two hours. And well done Mike North for the lighting. 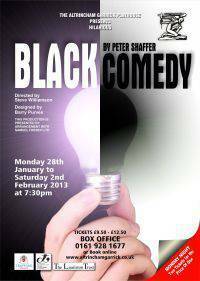 Black Comedy is from the pen of Peter Shaffer, who also wrote the acclaimed plays 'Equus' and 'Amadeus'. Black Comedy was first staged in the mid-sixties and the Garrick?s production is set firmly in that era, made clear in every aspect and detail from hair styles to costumes and music to suit, but, making the boldest statement of the 60?s style is the superb set (designed by Barry Purves) which captures the art d?cor of that period working perfectly, being set in the apartment of an artist. I particularly appreciated the symbolic use of telling the audience what doesn?t ?belong? with the use of brightly coloured blocks and shapes, against a backdrop of black and white. The use of simple blocks instead of actual furniture and props was such a unique and original idea which gave an impressive result, putting a bold and inventive stamp of originality on the piece. It soon became clear to me that this entire play derived from one quirky idea; what?s dark is light and what?s light is dark?. This visual opposite, which has been dragged out to the max, is pretty much all what it?s about. It can?t be an easy task for the players to stumble around the stage as if it?s pitch dark and the cast achieve the illusion very well. This is a play where you can really go to town to create some visual, choreographic genius! The play offered numerous laughing points and worthy stunts, in particular, George Bamberger?s fall/jump into the cellar! Laura Whitehurst and Trevor McKie as Brindsley and Carol were not particularly suited, the coupling was unbelievable as was their relationship. I appreciate the character of Carol is an annoying and irritating woman but, the danger here is that if the comedy that accompanies this dippy character is not exposed (which it wasn?t), all you?ll be left with is a character which is simply annoying and irritating. Stealing performances of the piece for me, were the two ?carry on? inspired supporting roles of Miss Furnival ? played by the very capable Janet Slade whose final speech was the cherry on top, having us all in stitches of laughter. And Harold Gorringe ? played by Brian (Charles Hawtrey) Howlett was superb as the fussy, camp neighbour. Bev Stuart-Cole gave a notable performance as Brindsley?s ex flame who?s still burning bright, Clea. This was an odd choice of production for the Garrick to present, being a one act piece. The director had included an interval (and chose the perfect spot to do so) but, the show came down before 9:30pm making it a rather short evening. Still, I like the mix of productions offered from the company. The Garrick committee are taking risks when choosing material to present which is an approach I will always encourage, to any group!